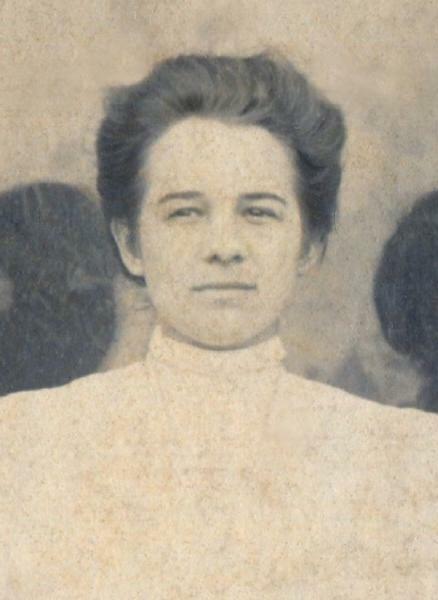 Olive Elizabeth Bay was born on 5 January 1891 in Fairview, Grimes County, Texas. Her name was recorded as Olllie. John Edwin Bay and Stacy Scott Teague appeared in the US federal census of 1 June 1900 in Grimes County, Texas. Other members of the household included Olive Elizabeth Bay, James Foster Bay, Willie Agnes Bay, Claudia Gertrude Bay, Mary Lee Bay, Francis Oscar Bay and Eugenie Salome Bay. John Edwin Bay and Stacy Scott Teague appeared in the US federal census of 15 April 1910 in Grimes County, Texas. Other members of the household included Olive Elizabeth Bay, Francis Oscar Bay, Eugenie Salome Bay and Myrtle Ernestine Bay. She was a school teacher, according to the 1910 census. She married James Clifford Crutchfield, son of David Alonzo Crutchfield and Della Frances Smith, on 9 May 1915 in Grimes County, Texas. James Clifford Crutchfield and Olive Elizabeth Bay appeared in the US federal census of 1 January 1920 in Bedias, Grimes County, Texas. Other members of the household included James Clifford Crutchfield Jr. and Mary Olive Crutchfield. She was working on the home farm, according to the 1920 census. James Clifford Crutchfield and Olive Elizabeth Bay appeared in the US federal census of 1 April 1930 in Grimes County, Texas. Other members of the household included James Clifford Crutchfield Jr., Mary Olive Crutchfield, John David Crutchfield and Paul Crutchfield. James Clifford Crutchfield and Olive Elizabeth Bay appeared in the US federal census of 1 April 1940 in Singleton, Grimes County, Texas, at Highway 90. Other members of the household included John David Crutchfield and Paul Crutchfield. She officially witnessed the death of James Clifford Crutchfield on 14 January 1969 at Grimes Memorial Hospital in Navasota, Grimes County, Texas. Olive Elizabeth Bay became a widow at the 14 January 1969 death of her husband James Clifford Crutchfield. At the time of her death Olive Elizabeth Bay was living in Navasota, Grimes County, Texas, at 710 Teague Street until eleven months before her death. Olive Elizabeth Bay died on 14 December 1970 at age 79 in Bellville, Austin County, Texas, at Sweetbriar Nursing Home . Her death was officially witnessed by John David Crutchfield.